Employers in the retail, hospitality and travel sectors are actively preparing to exploit a loophole that will allow them to grade their own apprentices, FE Week can exclusively reveal. Our findings have caused concerns that the independence of end-point assessments is being seriously compromised. The rules, which will be upheld by the new Institute for Apprenticeships from April, normally dictate that assessments must be carried out by an independent assessor to ensure impartiality. But an exception was granted to these three sectors in 2015 by the former skills minister Nick Boles, which FE Week understands happened against the will of civil servants. The Department for Education told FE Week that despite the exception employers would still need to register with the Skills Funding Agency as apprenticeship assessment organisations. However organisations are investigating a potential loophole that might save them from even applying to become an AAO. Innovate Awarding, a registered AAO in the retail and hospitality sectors, confirmed to FE Week that it was exploring this model, “with customers where we can ensure there is no conflict of interest and the independence of the assessor can be evidenced”. 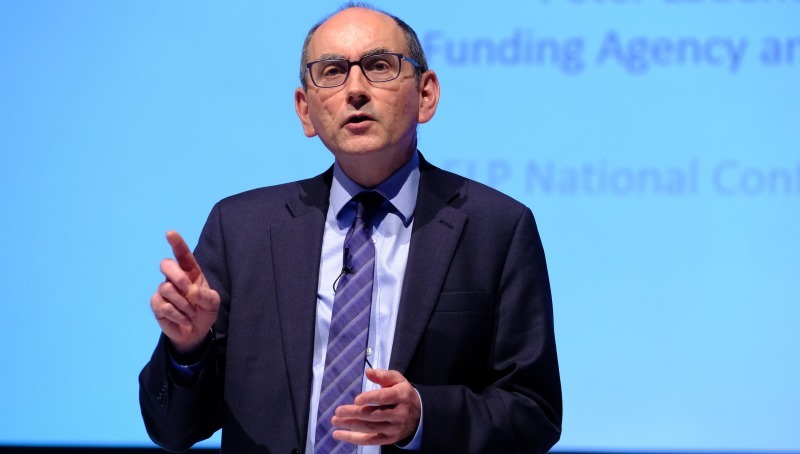 Speaking during a webinar earlier this month, the IfA’s shadow chief executive Peter Lauener [pictured above] appeared to be unaware of the loophole. Asked about employers using their own staff to carry out end-point assessments, he said: “I think you can see some circumstances where there’s such niche provision that there were comparatively few experts”, adding: “I don’t think I’ve seen any arrangements like that so far”. The AELP boss Mark Dawe, an assessment expert and former boss at OCR, urged the IfA to treat all sectors the same. “The IfA needs to be crystal clear as to what a conflict between the employer, provider, AAO and their respective staff [looks like], and what safeguards are expected. Whatever that approach, it should be applied in the same way to everyone involved. “In this case the AAO has the responsibility to demonstrate its independence as well as the employee’s, being free from any undue employer influence”, he said. According to the DfE, ministerial exception was granted to the three sectors following requests from the industry, and came after careful consideration. People 1st, the body chosen by employers to manage the external quality assurance confirmed that to date no employers in these sectors have registered as an AAO. Instead, companies are understood to be looking at arrangements that would see members of an employer’s staff taken on by the AAO on a consultancy basis, as described by Innovate Awarding. The AAO is then responsible for training that member of staff, ensuring the independence of the end-point assessment and quality assurance, but not the actual delivery. One major employer understood to be exploring this arrangement is McDonalds, which was involved in the development of the retail standards. However, a spokesperson for the fast food giant said end-point assessment of its apprentices would be carried out by Innovate Awarding, rather than its own staff. A spokesperson for Ofqual said that those AAOs which it also assures externally must do “everything possible to ensure that no one with a personal interest is assessing an apprentice”. Strange, odd, poorly thought out, badly implemented, not really needed – poor quality and bad press due mainly to a mania for numbers which opened the floodgates for opportunists (loopholes to be exploited). That’s what I think about the reforms, not sure you should have asked.